Why is your sales team not meeting your expectations? I ask this question to my clients on a first call to get their perceptions about why their sale team is not meeting expectations. Sometimes I get clear responses. Mostly I receive vague ones. I assembled these questions to help my clients think through some of the issues and find the root cause of the problem. From there, we develop an on-target sales team development solution. 1. Do I have the right salespeople? This is not about sales experience. This is about the specific personality style, motivations and decision-making capacity. Fundamentally, you must be sure that each sales rep is wired for professional selling. If not, no matter how much training, coaching or disciplinary action you take, they simply cannot do the job. Only an honest assessment will do. Too often I’ve worked with companies where the leadership was unwilling to face the facts that some of their sales reps should have never been hired. 2. Are my sales reps in the right sales roles? Tom Brady is a great football player. That does not mean he would perform well as a linebacker or offensive tackle. He excels in one position – quarterback. The same applies to salespeople because not all sales roles are the same. Therefore, they require the right person to succeed in that role. Does your sales role call for a Hunter or Farmer? Inside, outside, enterprise, field sales or call center? Is there prospecting involved? Do you provide Company-generate leads or is the sales rep required to develop self-generated leads? Is it a cold calling or warm calling job? Is the focus on new business or customer retention? Each of these factors (and many others) affect the type of salesperson you need. In the wrong role, a once flourishing salesperson can fail miserably. You need to know the attributes of each sales rep and ensure they line up with what the specific sales role requires and rewards. 3. Is the compensation plan fair? Does your compensation plan provide sufficient pay equal to the effort involved? Is it based on gross sales or margins? Is the base salary too high or too low? Is the draw sufficient to live on until a sales rep develops a suitable pipeline? What percent of total income is salary? How about commissions? A good compensation plan incentivizes your sales reps where you want them to go and rewards their success. Does yours? 4. How well are my sales reps being coached? Every quarterback in the NFL has a quarterback coach. These are the best players on the planet and they all have a dedicated coach to help them improve performance. Why shouldn’t the people responsible for generating revenue for your company have the same? Let me clear – every sales rep has an area of development they need to work on to get better. A good sales coach knows the strengths and weaknesses of each sales rep and always has a working develop plan in place. 5. What are the external factors, if any, affecting each sales reps’ performance? If a sales rep is not achieving their quota, it may be their fault (or maybe not). You need to evaluate the issues and obstacles preventing your sales rep from succeeding. Your company may suffer from uncompetitive pricing, underperforming customer service, or poor technical support. These affect sales and the moral of your sales team. Regardless, if poor performance is the sales reps fault, then take the necessary action. If it’s not, then be honest about the failings of the company and fix them. Everyone must do their part to remain competitive. 6. 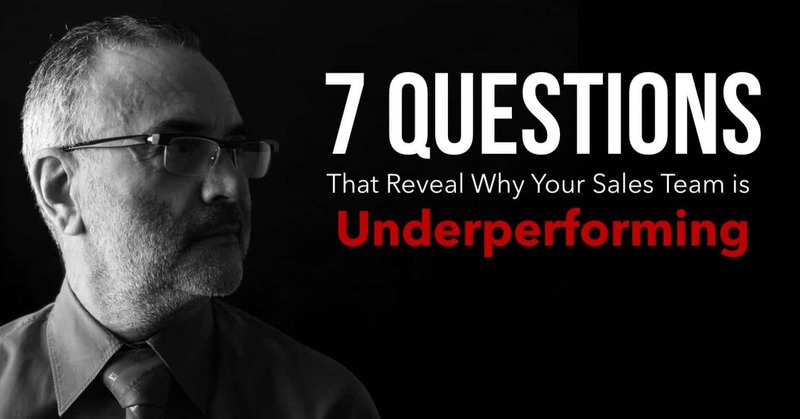 What resources do my sales reps need to improve performance? You may find that they don’t have sufficient market data, sales collateral, or accurate database records. In addition, they may need marketing support, social media training or lead lists. Examine the weak points of your sales process. In which step do your salespeople face the greatest challenge? Where do leads, opportunities and sales drop off? Find the resources your sales reps need to bridge the gap in that step. 7. What non-sales responsibilities need to be removed from my sales reps’ plate? How much time do your sales reps waste engaged in non-sales activities? What could they be doing instead? Selling, maybe? What is your opportunity cost when your expensive sales reps are engaged in hours of data entry each week? How much does that cost you in time, salary and lost sales in a year? Make a list of the activities that need removing and start addressing each one. You may need to add a sales support person instead of another sales rep.